One of the highest forms of social media currency is a verification logo on top networks like Instagram and Twitter. Though both are governed by separate social media entities, the parallels as far as successfully being verified are very similar. For those not in the know, a blue verified icon on Twitter shows that an account of public interest is authentic. A Twitter verified account badge is always placed next to the account name and is only applied by Twitter. First, head over to Twitter’s verification request form to start the process for how to get verified on Twitter. Note that you’ll need to be logged into your target Twitter account to complete the form. A verified phone number. This helps to confirm your identity and correctly associate your online persona with your offline entity. A confirmed email address. According to Twitter, if the account is a company or organization account, the email address associated with the account should be a company or organization email address (i.e. info@yourwebsite.com). A bio. For best results during the process of getting verified on Twitter, it should accurately reflect the nature of your public persona. A profile photo. If you have a strong presence on another social network (LinkedIn, Instagram, Facebook, etc. ), make sure these photos match. On networks like Instagram where you cannot yet request verification, they grab relevant information from other social networks to make a verification decision. A header photo. When considering brands for verification, Twitter holds those that have completed their profile in the highest regards. An incomplete profile will hurt your chances, even if you fit all other verification dimensions. Your birthday. This is only relevant for accounts that aren’t company, brand or organization). You can choose to display this information depending on the audience you’ve chosen and can change that in your settings. Like your phone number, this simply helps to confirm your identity. Your website. If you’re a public figure or brand, you really should have a website. Twitter will use this to determine your status as a legitimate entity. Tweets set to “Public.” It’s hard to be seen as a public figure if your Tweets are private! Once you’ve double checked that your profile is set up correctly with all relevant information, you’ll be asked to enter the username of the account you would like verified. 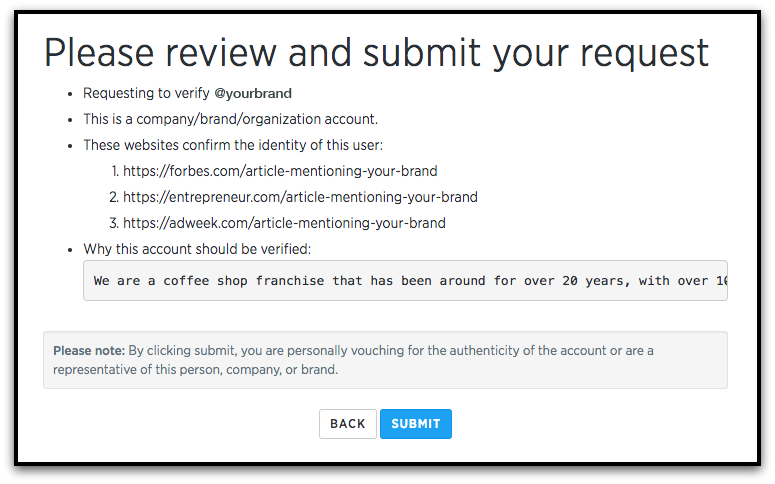 If you’re trying to have a business account verified, don’t forget to check the box at the bottom left of the screen to indicate this. If you haven’t optimized your Twitter profile or filled out the information required (as stated above), you will be prompted to do so. You’ll know right away if this is the case with your profile, as Twitter will display a page that says “Account Not Eligible for Review” if you lack something important mentioned above. You will have the chance to fill in the missing information for another chance to submit yourself for verification. If you’re trying to get a personal account verified, the account name should reflect the real name or the stage name of the person. Similarly, if the account is a company’s or corporation’s, it should reflect the real name of the business. The profile and/or header photo should reflect the person or the company’s/corporation’s branding. If you’re trying to verify a personal account, make sure to use a profile photo that matches other online profiles. If you’re trying to verify a brand account, make sure to use your logo, and incorporate other elements of branding (like color scheme) into the cover photo. The bio should specify an area of expertise and/or a company mission. If you’re starting from scratch, consider these tips for how to optimize your Twitter bio. Make sure that your Twitter account is active. Twitter introduced the verification application process to help people find high-quality accounts to follow. If you aren’t tweeting often, you aren’t helping Twitter reach this goal, and they’re unlikely to recommend you for verification. Use professional photos. Having a consistent brand image will make your account easily recognizable, and will help Twitter to confirm your identity. Be precise with your location, especially if you’re a local business. This is so Twitter can connect you to people nearby. Learn from the users featured on Twitter’s @verified account to see what they’ve been doing, then emulate parts of their process. The next step in the process for how to get verified on Twitter will ask you to enter up to five websites that can be used to identify you, and associate you with your Twitter account. As your official website is listed in your bio, there’s no need to enter that again. It would be a better use of space to introduce additional websites that can help to verify your identity. For best results, share links for websites that show proof of your public influence. These might include high-traffic websites or instances of appearances in the news. At this point in the application, Twitter will provide a section where you can make the case for why your account should be verified. If you’re applying as an individual, demonstrate your impact. Show your public reach, as well as instances where you’ve made waves in your industry. For companies and corporations, highlight your mission/vision and what you’ve been doing to achieve it. You only have 500 characters to make a case, so don’t over think things. In general, focus on sharing the ways that you or your brand adds value to the Twitter community. Another angle you can take would be as a rising star in your given industry. If you’re getting more attention, there may be a higher likelihood of other accounts trying to impersonate you. As the major goal of verification programs on social media is to clearly identify public figures, Twitter has a vested interest in helping people to protect their identities as they get more well-known. If you can demonstrate that this is a pressing issue, Twitter will be more likely to grant your request. Once you’ve carefully confirmed the validity of the information you want to submit, then actually do so, all you can do now is wait. Twitter will email you as soon as a decision has been made. Additionally, you’ll know that you’ve been verified once the @verified Twitter account follows you. If your request is rejected the first time around, know that you can apply again after 30 days. And if you do get verified, note that verified Twitter accounts that do not follow Twitter terms and conditions (or use the account for another purpose) can have their verified badges revoked. Signals of high authority and authenticity. After all, 85% of customers buy products and patronize services from brands they trust. Twitter is a great place to build thought leadership, and a blue verification check mark generally correlates to easily building more followers. Special account management advantages that include being able to opt out of group direct messages as well as the ability to restrict notifications to other verified accounts. What was once reserved for celebrities and key personalities that Twitter verified through their own methods, now has been made available for all to apply. As of July 2016, Twitter created an online application for users to have their accounts verified. In the past, the process for how to get verified on Twitter was difficult. Now, Twitter made it possible to request verification—all you need to do is make sure you have all your ducks in a row before applying. A stellar online presence can help you push through, even if you don’t have many Twitter followers just yet. There’s hope for anyone who can make the case that they deserve or need it! Have you figured out how to get verified on Twitter? Share your secrets with @SproutSocial, and we’ll retweet the best insights!